The problem is that I haven’t submitted a project for IRB approval yet, so I’m a little limited in what I can talk about here. On the upside, everything that I’ve learned from my IRB Reviewer training is that my own personal experience doesn’t count as “research” for the purposes of that governing board. So I’ll limit myself to that for now. For a while now I’ve been “stuck” on an article I have been writing on the French banlieue riots of 2005 & 2007. These served as a kind of punctuation mark to my period in the field, and also as a kind of cotillion for the pervasive effects of the Nicolas Sarkozy-inspired assemblages of police tactics I had been watching take shape. From the beginning I knew there was a slant to both the media coverage and social scientific analysis to which I wanted to run counter: too often these skipped over the actual police technologies (understood broadly here to include, but not to be limited to, the material objects of policing) that were at the core of the story and that were the original impetus for the riots. In knew this was what I wanted to do but, like I said, I’ve been stuck. For years. Yes, I’ve been writing other things in the meantime, but I still go back to this unpublished article, Electric Burns. However, recently I’ve been introducing myself to what some call “the new ontology“. I’ve been so moved for a variety of reasons, primary among them the exciting work of my wife Katie Hendy on the materiality of pharmaceuticals, itself inspired by the work of Isabelle Stengers and Andrew Barry; secondary among them was recent Newtown shooting, the consequent serious thought to the agency of things, such, as guns, that it forced and the general reminder from the blogosphere that anthropology in fact has a long tradition of working through that tangled problem. All of this is a roundabout entree into the fact that I attended a TASER X2 training seminar last night with the EMU Police Department. My presence there was due, in part, to the fact that several of the members of my department balked at the news that such “non-lethals” were adopted without consultations with–or even notification of–the faculty. As a peace offering of sorts, Chief Bob Heighes offered some of the Crim faculty the opportunity to attend the training, and I took him up on the offer. Now, as I said earlier, I didn’t really have time to get a proper IRB approval, nor did I present myself as a researcher to those involved in the training, so to talk about too much of what went on would be a disregard of anthropological ethics. But I can write about, from a personal perspective, something that I think has some import: that is, what such tools do. 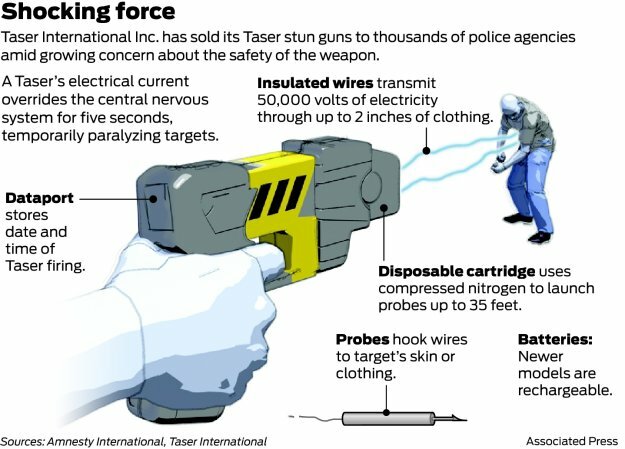 TASERS fire small dart-like electrodes with attached metal wires that connect to the gun, propelled by small gas charges similar to some air rifle propellants. It uses a temporary high-voltage low-current electrical discharge to override the body’s superficial muscle-triggering mechanisms. The recipient that is ‘connected’ to an electroshock gun feels great pain and can be momentarily paralyzed (only so long as there is an electrical current being applied) because his muscles are receiving electrical ‘shock’. The (relatively) low electric current—the model used by French police officers, the Taser x26 uses a 6 volt electrical supply, about the size of a common digital camera, to produce a current of 2.1 milliamps—must be pushed by (relatively) high voltage to overcome the electrical resistance of the human body. A shock of half a second duration will cause intense pain and muscle contractions startling most people greatly. Two to three seconds will often cause the subject to become dazed and drop to the ground, and over three seconds will usually completely disorient and drop an attacker for at least several seconds and possibly for up to fifteen minutes. The X2, used by the EMU PD differes from the X26 in that, along with an additional array of recordign and auditing technology, it contains two catrtidges which load in a semi-automatic style. Now, Chief Heighes wouldn’t let me get TASE’d along with (almost) everybody else in the training. And to tell you the truth, I don’t blame him. He doesn’t know me, nor do I think he really expected me to show up, and I’m sure he’s not very clear as to why I was there in the first place. Given all that, I probably wouldn’t TASE me either. But I was there. And one thing I did was “spot” one of the officers as he got TASE’d. This is a common part of TASER training, the purpose and effect of which is, I think, in need of more reflection. One of the things such training does, I now know, is emotional work. To call the probes “dart-like” is probably a misnomer. They are barbed, like fish hooks. And they embed into the recipient’s skin in such a way that the only way to remove them is to tug them out, quickly and directly, with a tug that removes a chunk of flesh as well. Due to the much more dramatic and painful spectacle of the shock, this part of the process usually gets overlooked. But I wasn’t shocked yesterday, nor did I shock anyone else. But I did pull out a probe. I don’t fancy myself the most squeamish person around, but sometimes an individual aware of the world around him is forced to process what he is doing. Sometimes, not too often, I go fishing. The last time I went fishing I caught a bluegill that was too small for the hook I was using. It swallowed the hook so thoroughly that the barb came out its eye socket, just below the eye. On the one hand, I was terrified. On the other hand, I knew to do nothing at that point would be ghastly. I tried to be firm and cool. I tried to not feel things that I was feeling. I held the fish down, secure to the ground, and tried to work the hook out smoothly and directly, just as I had done with the other fish whose mouths I had hooked. Unfortunately, the fish did not cooperate. It flailed and its eye popped like a grape. Its leap also removed it from the hook and it plopped into the water, where it swam away. I remember, in the end, being mad at the fish for making me such a destructive force. When I took out the TASER dart, I was thinking of that fish. Again, the task was to be cool, smooth direct and to disassociate. I tried. I pulled, at least. It came out, but it hurt and, like all TASER shots that night, bled. I remember deeply wanting to hug the “recipient”. As much to comfort him as to reassure myself. But I got the sense that such a display would be inappropriate, so I decided instead on a pat on the shoulder and walk away. I’m glad you found the post thought provoking. That was the goal. Right now I don’t have many answers either, but hopefully we can start moving towards better questions.